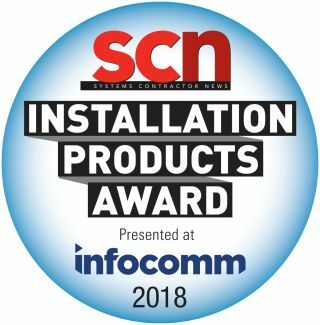 The wait is over—finalists for the 2018 SCN/InfoComm Installation Product Awards have been revealed. These awards showcase the most innovative commercial AV products of 2017, and the finalists were chosen by an independent panel of judges. The judges, all experienced integrators, read through each and every entry, and chose no more than three finalists per category. Now it’s up to you, our readers, to select the most innovative product in each category. The ballot will remain open until May 11. The winning products will be announced during a ceremony at InfoComm 2018. The ceremony will take place on June 5 at 2 p.m. in room N252 at the Las Vegas Convention Center. The unBT2A is a single-gang (Decora) wall plate that allows simple and robust Bluetooth streaming to an installed sound system from any Bluetooth-enabled device. The unBT2A provides a balanced stereo (or mono) audio signal to any audio system, allows the Bluetooth "friendly name" to be customized, and can initiate Bluetooth pairing from the front of the interface or via RS-232 from any control system. The unBT2A sports extended Bluetooth range and excellent audio quality. The premier wireless solution in Shure’s successful portfolio, Axient Digital builds on the benefits of the company’s UHF-R, ULX-D, and Axient wireless systems to create its most advanced wireless platform to date. Catering to evolving customer needs in today’s congested RF environment, Axient Digital provides high-performance RF, exceptional audio quality, networked control, command and control, hardware scalability, and specialty application transmitters including frequency diversity handhelds and a micro bodypack with an internal antenna. The YVC-1000MS USB speakerphone is certified for Skype for Business, having passed Microsoft’s stringent tests. The scalable and flexible UC speakerphone supports the audio requirements of large meeting rooms, rooms with special table configurations, and remote classrooms or seminars. The intuitive design provides fast, simple connection to a PC via USB and/or smartphones with Bluetooth. Featuring Yamaha's adaptive echo cancellation and other unique sound processing technologies, it facilitates stress-free conversation enabling positive collaboration. The PRSU Portable Flat Panel Stand was designed for every stage of use from storage to transport to set up to teardown. No tools are needed, and most people can set it up in less than two minutes, even the first time, according to the company. The rugged design can withstand common wear and tear. The PRSU also breaks down and folds up for easy space savings and can be stored in a customized, wheeled case accessory. Middle Atlantic Products’ Proximity Sliding Mounting Plate offers unrivaled ease of customization and convenient small-device mounting thanks to its patent-pending sliding design. According to the company, it’s the industry’s first sliding mounting plate to provide easily accessible AV storage right behind the display, enabling effortless installation, maintenance, and concealment of equipment. Patented Lever Lock technology and patented UMS pattern let integrators easily unhook the plate from the sliding mechanism and mount small components onto its 15-inch by 10-inch surface. Peerless-AV’s SmartMount Flat Wall Mount for Direct View LED Displays offers slim, space-saving, and aesthetically appealing designs that support various LED display sizes and brands. With features like integrated cable management, easy-hang hardware, adjustability on the X, Y, and Z axes, and a lightweight aluminum frame, users can quickly and easily build a direct-view LED video wall. For installations requiring a pop-out mechanism, Peerless-AV also offers its SmartMount Pop-Out LED Video Wall Mount. The Acclaim Series provides an indoor direct-view LED solution for today's retail, corporate, transportation hubs, and house of worship markets featuring pixel-pitch configurations of 1.2, 1.5, 1.9, 2.5, and 3.8 millimeters. Acclaim's HD aspect ratio and 27.5-inch diagonal size allows four panels to create a 55-inch display like that of a LCD, but without mullions. Acclaim features standard VESA mount, allowing the end user to work in a standard 16:9 aspect ratio. Barco UniSee is the most innovative large-scale modular LCD visualization platform to hit the market in decades. Features include: the industry’s first 0.3 millimeter mechanical “air-gap” between tiles; a unique, modular platform delivers unmatched color uniformity thanks to an automatic, continuous and real-time color calibration system; a high operational performance with a redundant, remote power supply; and a patented mounting system that simplifies installation and maintenance while solving typical large-scale video wall problems. The YIPLED Crystal Ice Screen is a new type of transparent LED display designed for live event and sporting stage application. On February 26 at the Pyeongchang 2018 Olympics Closing Ceremony, 24 Crystal Ice Screens were used to showcase a performance; on March 18 at the 2018 Paralympics Closing Ceremony, eight Crystal Ice Screen were used again. The Pro L1755UNL features a laser-light source for virtually maintenance-free operation up to 20,000 hours, native WUXGA performance with 4K Enhancement Technology, and 15,000 lumens of color/white brightness for spectacular image quality, durability, and reliability. This premium, compact, large-venue projector operates at 120 volts—a breakthrough at this high range of lumens—and includes built-in edge blending, integration capabilities like 3G-SDI and HDBaseT, and nine optional powered lenses. The PT-RZ21K is the world’s first filter-free ultra-high brightness projector with the smallest footprint of any 20,000-lumen model on the market, according to the company. Compact and lightweight, the PT-RZ21K is designed for live events and any permanent fixed large venue. Providing 20,000 hours maintenance-free operation with a filter-free and durable dust-proof optical system, it features a dual-laser light source and built-in redundancy for uninterrupted projection, making the PT-RZ21K a great high-powered projection solution for high-profile, mission-critical applications. Black Diamond XL breaks the screen height barrier at 76 inches high by 150 inches diagonal with 16:9 aspect ratio. ALR is achieved by utilizing microscopic optical layers stacked on top of each other. Multilayer optic reflects only the light generated by the projector resulting in a 900 percent boost in contrast, according to the company. Options include Zero Edge Pro format, three bezel size options, 12 designer colors with an inlay of hand-wrapped velvet or completely wrapped in velvet. LED backlighting is also available. ATEM Television Studio HD and ATEM Television Studio Pro HD are broadcast quality live production switchers designed for both broadcast and professional AV users. They both feature eight inputs, multiview, auxiliary and program outputs, analog audio inputs, built-in talkback, two flash-based media players, creative transitions, a DVE for effects, and more. ATEM Television Studio Pro HD also features an integrated hardware control panel. Engineered in the Crestron DigitalMedia Lab, DM-NVX is the only secure network AV solution that now supports Dante and AES67, according to the company. Its exclusive, patent-pending technology eliminates the latency associated with network video. DM-NVX provides a high-performance, real-time AV encoder or decoder that transports 4K60 4:4:4 video over standard Gigabit Ethernet and enables fully scalable, enterprise-wide 4K content distribution. DM-NVX employs advanced security features and protocols, delivering a true enterprise-grade solution that easily fulfill demanding IT policies. Matrox Maevex 6150 quad 4K enterprise encoders allow for the simultaneous capture, streaming, and recording of up to four 4K inputs. The all-in-one, SRT-ready appliance can feed on-premises and cloud-based servers to reach internet viewers, push many streams over LAN for local audiences, and record to local or network storage for later editing and viewing, concurrently. FIBBR’s ISF Certified Ultra-Pro HDMI Fiber-Optic cables for 4K transmission are socket-powered and made with the highest-quality glass fiber for the best 4K picture and sound. Ultra-Pro features proprietary BendRobust technology, which allows the fiber to be bent 180 degrees, to guarantee flexibility and durability in extreme conditions with uninterrupted transmission of signals. They are slim and flexible, yet strong and extremely lightweight—60 percent lighter than traditional cabling, according to the company. Panduit's simple-to-attach Field Term Plug is designed for connecting a wide variety of devices, including components like HDBaseT transmitters and receivers, encoders and decoders, and networked AV devices. Designed for quick and easy termination to twisted-pair copper cable, the compact field term plug easily fits in tight spaces. It meets Category-6A performance standards and is backward compatible to Cat-6 and Cat-5e making it ideal for any type of AV installation. The large-format UPS line features three models to suit different installations: 10,000 volt-amps (10kVA), 15,000 volt-amps (15kVA), and 20,000 volt-amps (20kVA). The large-format UPS line addresses several problems through one solution: they have the capability to safeguard an entire installation from sudden loss of power, dirty power from on-site generators, and sudden surges once the power from the utility is restored. InFocus ConX Cloud is a powerful and affordable videoconferencing service for flexible and robust collaboration. Businesses can start at $4.99/month for 10 seats of HD video and real-time visual connectivity for data, presentation, and content editing. ConX Cloud supports SIP, H.323, and Skype for Business interoperability, and works on iOS and Android smartphones and tablets, Windows, Chrome, and Mac OS computers, as well as InFocus devices such as Mondopad, ConX Exec, and ConX Phone. Solstice allows any number of meeting participants to easily share and control content from laptops and mobile devices to the in-room display over existing Wi-Fi/Ethernet networks. By placing content at the center of the collaboration experience, meetings start faster, participants are more engaged, and information flows freely, improving results, productivity, and ROI. Solstice is designed as a scalable and affordable solution with all the management and security capabilities required to support deployments of any size. Cynap Core was built for systems integrators who are looking for a durable and reliable collaboration solution that is ready for enterprise-grade network deployment. It provides 1080p/60Hz wireless video presentation, powerful BYOD, and cloud file access, with no apps or dongles required. Breakthrough new features include Touchback, enabling multiple users to wirelessly see and control the presenter’s PC, and inter-Cynap video streaming, for creating active learning classrooms with vSolution Matrix. The Icron USB-3-2-1 Raven 3104 is the world’s first and only USB 3.1 backward compatible to USB 2.0 extender system over Category cable, according to the company. Providing four ports at the remote endpoint, with 6W of power at each port, the system can extend up to 100 meters (330 feet) over Cat-6a/7 cabling. The Raven also supports all USB device types and classes including new USB 3.1 PTZ cameras, touchscreens, audio, and mass storage devices. Luxul’s AV Series AMS-2642P Managed Switch features rear panel ports and front facing LEDs (user selectable) for clean integration with AV systems. An excellent choice for expanding the network when using PoE-enabled devices (VoIP, IP cameras, and Wireless Access Points), the 26-port Gigabit switch includes 24 PoE+ ports, allowing integrators to use standard Ethernet cable to deliver both power and high speed data to 802.3af/at-compliant devices. It also features advanced management, VLAN and security capabilities. The newest addition to the popular Vanco International Evolution line of curated pro audio and video distribution products, the EVO-IP HDMI over IP system provides installers the ability to manage, transmit, and receive audio/video signals and control hundreds of devices over a local network. And, it efficiently uses only three products to do so—a transmitter, receiver, and control box. HyperDeck Studio Mini is a miniaturized professional deck that records and plays back broadcast-quality 10-bit video using common SD and UHS-II cards. HyperDeck Studio Mini features 6G-SDI for working with all SD, HD, and Ultra HD formats up to 2160p30. HyperDeck Studio Mini is unique because it includes HDMI for monitoring, a built-in sync generator, and ethernet for uploading media via FTP, making it an ideal solution for digital signage tasks. DesignCentrix's patent-pending PanoScape is a multifunctional interactive video wall designed for Tulane University's A.B. Freeman School of Business. Powered by a proprietary set of programs, and using Elo's 70-inch touchscreens with a unique touch-spanning capability, PanoScape displays a 10K-by-2K video across all nine touchscreens. Upon a user touching any of the monitors, all displays instantly switch into interactive mode, where up to nine people can interact with unique content at each screen. Designed for digital signage applications, Peerless-AV’s All-in-One Kiosk Powered by BrightSign delivers Full HD 1080p60 single video decoding, HTML support, networked content playback, as well as an abundant set of features like remote snapshot, live text, media feeds and multi-zone, and much more. With an integrated 55-inch commercial LCD display offering six points of IR touch, the All-in-One Kiosk fully engages users, making it optimal for a variety of uses. CloviFi is the world's smartest Wi-Fi audio transmitter, according to the company. It is ideal for consumers at home, seniors, those struggling with hearing loss, as well as businesses in public places. CloviFi enables users to privately listen to TV audio streams through personal mobile devices over Wi-Fi, without disturbing others nearby. XiO Cloud provides IT managers with a powerful centralized tool that enables them to deploy and manage 100 or 1,000 devices in the same amount of time as it would to manage just one, according to the company. Using simple drag-and-drop functionality, devices can be named, configured, and organized by groups and subgroups. Settings and firmware updates can be silently pushed to one or all devices and device licenses can be quickly activated, transferred, or removed. vSolution Matrix presents a new development for IP-based video installations in active learning classrooms and courtrooms. Whereas traditional video-over-IP deployments required the purchase and installation of dedicated encoders and decoders, vSolution Matrix routes high quality, low latency video streams directly between WolfVision’s Cynap devices over a local area network. Video matrix distribution is now just a matter of networking Cynap-powered workstations together. Other breakthrough advancements include drag-and-drop routing control, live multi-stream previewing, temporary stream layering over local content, and remote file-sharing/presentation over IP. Blackmagic Web Presenter allows customers to use professional SDI and HDMI video sources with streaming software and services such as YouTube Live and Facebook Live. Featuring 12G-SDI and HDMI connections, Blackmagic Web Presenter will down-convert SD, HD, and Ultra HD sources and make them look like a 720p USB webcam. As all streaming software works with webcams, Blackmagic Web Presenter makes it easy to work with any streaming software, but with dramatically higher quality. Crestron XiO Edge is the only IT-approved cloud control platform, according to the company. The cloud-based control system brings all of the power found in Crestron’s 3-series control systems to the server allowing you to harness your entire IT infrastructure, security, scalability, and more on the trusted platform Crestron has been providing you for years. Crestron XiO Edge offers secure endpoints, inbound connections, redundancy, and service-oriented architecture that can be fully integrated into any automation system. The newly enhanced Cynap introduces a new product category for commercial systems integrators: the all-in-one AV/IT appliance. It combines the primary ingredients of system integration into an easy-to-install, network-manageable solution. Its highly configurable functionality includes wired/wireless video presentation, source switching, matrix routing, videoconferencing, recording, web browsing, cloud file access, IP video streaming, digital annotation, audio handling, and room control. NOTE: VOTING CLOSED ON MAY 11, 2018.